Once a property is deemed ‘historic’ by being listed either on the National Register of Historic Places individually or contributing to a historic district or is part of a Certified Historic District, a project can receive tax credits, which lowers the taxes owed, on qualified rehabilitation expenses if their work conforms to the Secretary of the Interior’s Standards for Historic Building Rehabilitation. and preserved more than 40,000 buildings that form the historic fabric of our nation. The state credits apply to income-producing property including either commercial or residential rental property, or personal residences that are certified historic structures and meet the minimum investment threshold. Missouri law provides an investment tax credit equal to 25% of approved costs associated with qualified rehabilitation made after Jan. 1, 1998. The federal credits are limited to income-producing, depreciable property only. The property may be either commercial or residential rental property that is certified historic. A taxpayer’s personal residence would not qualify for the federal credit. (The 20% credit is available for properties rehabilitated for commercial, industrial, agricultural, or rental residential purposes, but it is not available for properties used exclusively as the owner’s private residence). The federal and state credits can be used in combination for the rehabilitation of commercial or income-producing properties. The cumulative positive impacts on the national economy included $271.4 billion in output, $134.1 billion in GDP, $98.6 Billion in income, and $39.3 billion in taxes, including $28.6 billion in federal tax receipts. The leverage and multiplier effects noted above support the argument that the federal HTC is a strategic investment that works. Missouri National Register List Click on a county to see that county’s National Register listings. Statistics from FY2010 show how well the program is working. Tax credits awarded in FY10 reflect private investment that was taking place during the worst of the recession. Credits issued in FY2010 accounted for $632,894,262 in redevelopment, 1,571 jobs (not counting construction jobs), and 1,817 new housing units. -Department of Economic Development Statistics. It should also be noted that, because not all project costs are eligible for the 25% credit, state historic tax credits accounted for just 16% of that total, and as always, credits were not issued until after the buildings were put into service. The links below are resources to help understand the tax credit program and tools to demonstrate how Historic Tax Credits have had an economic impact on the state of Missouri. Use them to educate yourself and your elected officials. 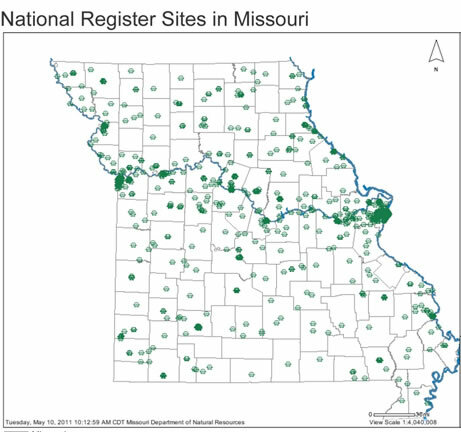 See Missouri By the Numbers to learn more about our Parks and National Register Listings. Check out the yellow tool bar on the right. It is important that you let your legislators know that you support the positive economic impact that the State Historic Preservation Tax Credits deliver in Missouri. Don’t know your legislator’s name or contact information? You can find it at http://www.moga.mo.gov.